I am a painter, and my favorite medium is watercolor. I am very fortunate that I have been able to paint from a very early age, and that I have had successes and much encouragement until this day. All artists have their own unique relationship with the art they make. This, I mean both in the broad meaning of the word as well as regarding the mechanics of applying paint to paper. While painting on a regular basis, I find that consistency and control increase along with greater sensitivity during paint application. In my lifetime, like it or not, the information age has intruded and requires careful control. Cell phones, talking GPSes, hand-held computers — they all have a place, yet I have found that they affect my sensitivity in any work I do. They all become collective static that requires filtering, or simply shutting off, so that I might tap into my creativity. There are times when deadlines, lack of time, or fatigue can create ‘the perfect storm’ at my easel. Early on, I learned the outcome of falling asleep with the loaded brush drifting without aim across the paper: a day's work ruined. Now, I am keenly aware when I've been working too long and experience punchiness at the palette. (And no, the punch bowl was not the reason.) Without a break, I might use a prior paint mix rather than take the time to mix something fresh and closer to what I am after. Instead, I recognize when it is time to step back and rest. Discipline is necessary in painting, too, and I try to paint responsibly. In my opinion, patience is at least as important as artistic talent in practicing art. Any job can have tedious parts, and in art, that is no different. I believe I have the gift of patience. It is the ability to spend many hours planning and drafting before the actual painting begins. Often I'm not even aware how much time has passed when I finally do pick up the paintbrush. When I practice art, I pursue a goal and plan to the degree necessary given the project I am working on. Beyond that however, there is mystery, thrills and spills, and even a little chess thrown in. Sounds more like a job for Mr. H. Potter? Possibly, except that watercolor requires no wizardry. It is more dynamic than any painting medium I've experienced, certainly very fluid, and therefore requires responsiveness. 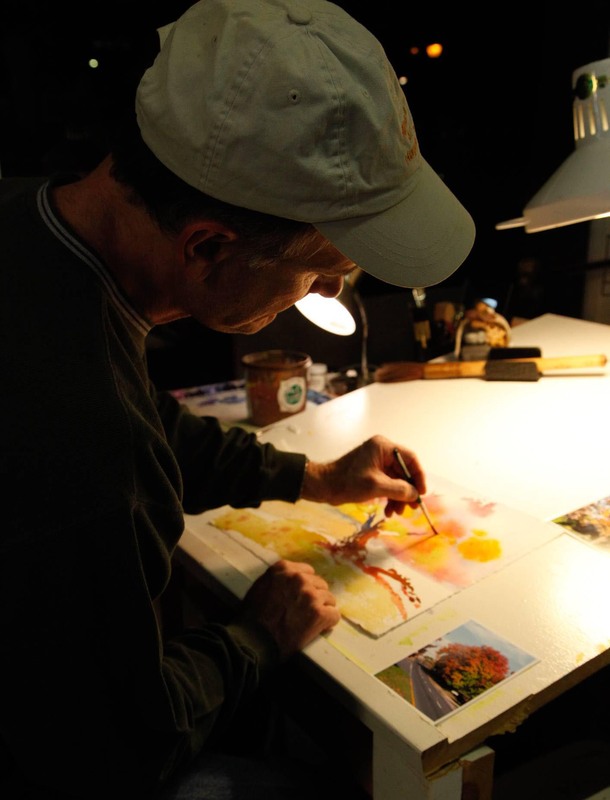 This translates to adding, often subtracting, and modulating color value and edge quality in order to reach unimaginable, unpredictable outcomes in painting with watercolor. Responsiveness requires all of the three aforementioned guidelines. It is gentle control and deft stroke all in one. And it is something I earn if I practice art from the heart.